Pete Rainey needs to stop crying about Hone Ma Heke and support a policy that will actually benefit the people of Nelson. What Nelson needs isn’t to raise a lynch mob and go after a protester – it needs to legalise cannabis. 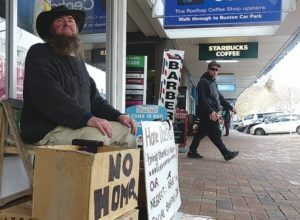 In few places on Earth does cannabis have more popular support than among the people of Nelson. This is a hugely pro-cannabis area, with the sentiment only getting stronger the further West from Nelson one goes. Almost everyone here smokes it – young, old or in between. You can see Bob Marley posters in several stores and a handful of others openly sell cannabis paraphernalia. So a mayoral candidate that promoted such a thing would have the support of the locals. Also, we need the money here in Nelson. It has been estimated by the Treasury that cannabis law reform would make the country $330,000,000 per year, roughly half of that savings from not enforcing cannabis prohibition and the other half from taxes. If the Nelson area has 1.5% of New Zealand’s population, it stands to reason that we would reap 1.5% of the savings of cannabis law reform. This amounts to almost $5,000,000 per year. With the proceeds from cannabis law reform alone, Nelson would save, in ten years, enough money to build a gondola that rivalled the biggest gondola in the world! That’s the sort of vision Nelson needs – not petty hatred aimed at a guy already at the bottom of the ladder.